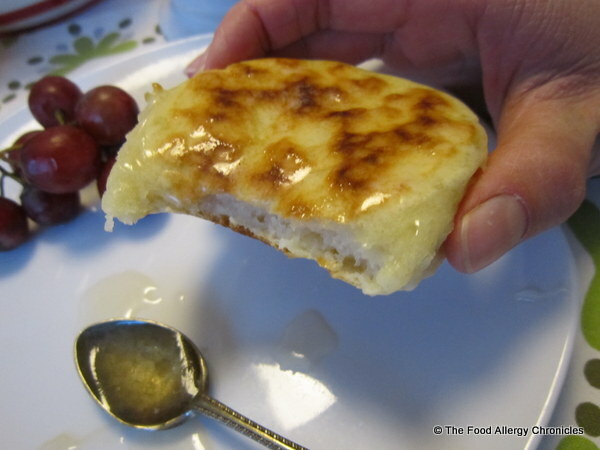 Posted on January 9, 2013 by Susan H.
Tea and Dairy, Soy and Peanut/Tree Nut Free Crumpets anyone? Or in my boys’ case…a mug of Dairy Free Hot Chocolate! I am always on the look out for breakfast ideas to adapt…Michael tends to fall into a ‘breakfast rut’…whereas, Mattthew is quite content with his bowl of hot oatmeal with milk and pure maple syrup. 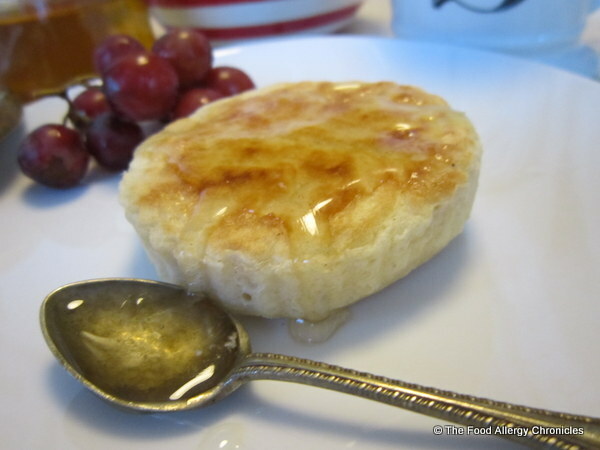 Pre-packaged crumpets at the grocery store (may contain dairy, sesame seeds, and/or egg) are off-limits due to his food allergies. Enter Canadian Living Magazine’s December 2012 article, ‘Griddle Me This’, to the rescue! 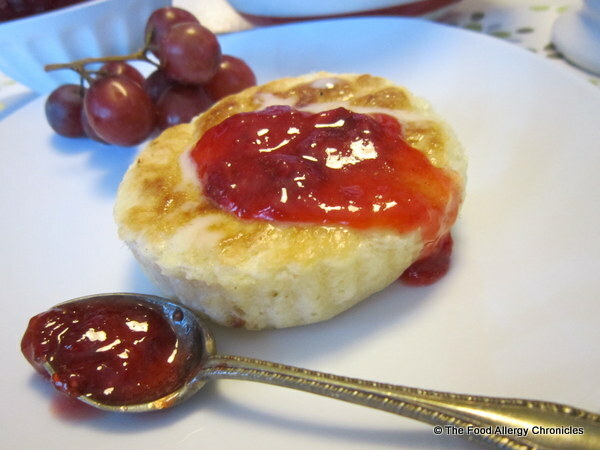 I was so excited to find a recipe for Crumpets that I could easily adapt. With no egg in the recipe, I just had to substitute Natur-a Soy or Rice beverage for the milk. Click here for the original recipe. 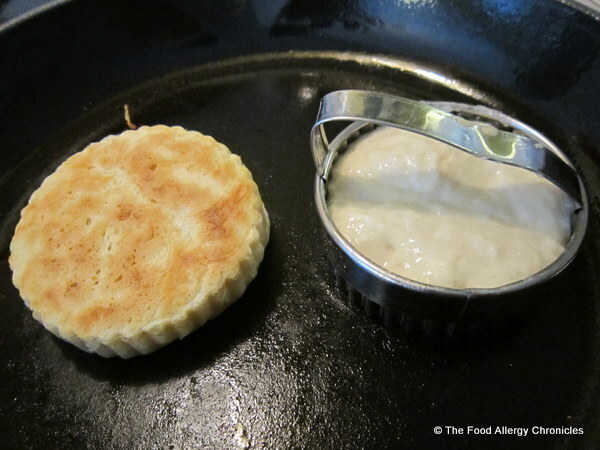 I improvised with the 3-inch ring mold and used a 3 inch fluted cookie cutter…worked fine but could only make one crumpet at a time. Upon turning the crumpet over, I started another crumpet. Michael’s eyes lit up when he heard that I was making Dairy, Soy and Peanut/Tree Nut Free Crumpets for an after school snack. The boys’ favourite topping…Vegan Becel Margarine drizzled with local honey. All but three, Dairy, Soy and Peanut/Tree Nut Free Crumpets, were gobbled up. Michael enjoyed one toasted for his breakfast along with a mug of Dairy Free Hot Chocolate before he headed off to school. P.S. To save time, I cut the recipe in half…next time I would use a proper 3-inch ring mold and make a full batch, freezing any leftovers to toast for a quick breakfast or snack. Tip: If you find yourself, like I did, forgetting to add the canola oil…don’t worry…gently mixing it in after the hour rest works fine. This entry was posted in allergies, baking, breads, breakfast, dairy free, egg free, multiple food allergies, peanut/tree nut free, soy free and tagged Canadian Living magazine, Canadian Living Magazine's recipe for Crumpets, Dairy Soy and Peanut/Tree Nut Free Crumpets, Natur-a Soy and Rice Beverage, Vegan Becel Margarine by Susan H.. Bookmark the permalink.